Brief Summary: I’ll freely admit that I know very little about this little two-day affair north of the Union bridgehead on the James at Deep Bottom. The Third Brigade, First Division, Tenth Corps had established the bridgehead in late June, 1864, as a potential jumping off point for future forays against Richmond. In fact, multiple such forays would be launched in the coming months. But first, the Union soldiers in the bridgehead had to clear the area of Confederates who were intent on shelling Federal shipping in the James. The Confederates planted a battery one mile inland from the James on Four-Mile Creek (see map below) on June 28, 1864. During the past week the enemy have appeared in force on our front, and have exhibited considerable activity and industry in erecting earthworks and getting batteries into position to work on our transports and gunboats on the James River. 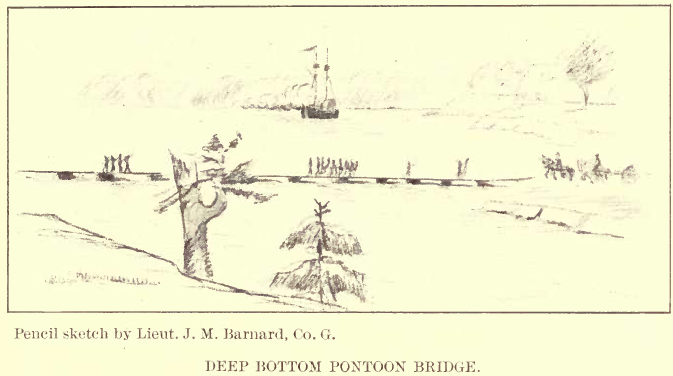 After considerable maneuvering, working after dark and screening themselves behind a belt of woods to escape the fire of our gunboats, the enemy managed to get a battery planted in a favorable position for shelling our transports while passing near the pontoon bridge at Jones Neck. The rebs erected their battery about a mile inland, near Four Mile Run, and uncovered it on Tuesday night [June 28] by cutting away the woods. The gunboat Hunchback shelled it during the day on Wednesday, [June 29] but elicited no reply until late in the afternoon, when the enemy opened on a tugboat towing a supply vessel up the river. The Hunchback “sailed in” with another gunboat and threw shot and shell over to the rebs in lively style, but with what effect I am unable to say. The effect of the rebel fire was a hole knocked into each of the gunboats, and the engineer of the tugboat had one of his legs knocked off. One of the monitors was immediately brought down the river and got into position, when she threw two or three blacksmith shops over to the rebs, which completely silenced them, and all was quiet on the James until yesterday afternoon [June 30], when a dispatch was received from Capt. Bell, in command of a detachment of the 24th Massachusetts, stationed on the bluffs below Four Mile Run, stating that a force of rebel cavalry, with two pieces of artillery, had made their appearance in that neighborhood. The Hunchback at once steamed down the river and shelled the woods and ravines in that vicinity. The rebs returned the compliment by shelling the pickets of Captain Bell’s command; but the gunboat kept the enemy at so great a distance that they could do us but little injury. Captain Bell’s command consists of Cos. A and C of the 24th Massachusetts. Our forces on this side of the river, consisting of cavalry, artillery and infantry, are under the command of Gen. R.S. Foster. It is positively known that there is at least a division of rebel troops in front of us — how many, or if any more, is not known. In our immediate front the enemy have erected two batteries, one pierced for four guns and the other four eight guns. It is reported to-day that the enemy have drawn off their artillery from our front, probably with a view of operating at a point further down the river. The enemy opened about half an hour ago on my earth-works below Four-Mile Creek with apparently two of the pieces engaged yesterday [June 29, 1864], firing some fifteen or twenty shots. As near as I can locate their position, it is at Maiden Hall. The Frenchman who lives at Allen’s farm reports that they passed the this morning. I have not heard from the garrison of the work, but think that no damage has been done thus far. The enemy removed his battery from Deep Bottom last night, thus avoiding the heavy gun-boat fire which opened on his position early this morning. This evening he opened a battery lower down, which Hunchback drove away. The enemy’s shell fell short of the camp of the garrison and did no damage. We are strengthening the rifle pits, making an infantry parapet of them and putting abatis in front. The work is all laid out and superintended by the engineers. The above, sadly, is all I’ve found on this little two-day affair. I suspect that the Naval Official Records might have some account(s) of the action, but I haven’t had time to start looking through those books in any depth just yet. If anyone has details on the fighting on July 1, what it involved and which units were involved on each side, please use the Contact link at the top of the page and point me in the right direction. I know of no book or magazine article written on this small action north of the Federal entrenchments at Deep Bottom. If you know of any, please let me know. This is one of the lesser known fights during the Siege of Petersburg which I’d like to learn more about.